On the outside, it seems like business as usual for people in this quiet Lincolnshire town. But there is only one topic of conversation filling Market Rasen's streets. The little town was the epicentre of an earthquake that shook thousands of homes across England. People in Newcastle, Yorkshire, London, Cumbria, the Midlands and Norfolk felt the tremor just before 0100 GMT on Wednesday. Appearance-wise, Market Rasen is unscathed. There have been few reports of structural damage and no reports of anyone in the county being injured. But the quake did cause minor damage to Julie and Robert Bristow's home. Fire crews had to knock down a chimney on their roof which became unstable. Mrs Bristow said: "The whole house just started shaking. It woke me up, it was terrifying. "The windows were shaking and at first we thought it must just be a train at the nearby station. 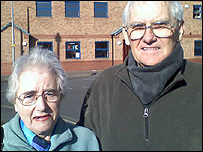 Eileen and Gordon Scott were both woken by the earthquake. Mrs Scott said: "We thought it was a plane crash. "The first we knew of it being an earthquake was when my daughter rang us from Scotland this morning. "When we found out we both said well, that's another thing we've lived through." The force of the quake threw one village resident from his bed. 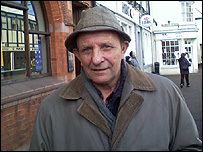 Rex Clarke, who lives in nearby Newton, said: "It was like I was made of cotton wool - I just flew across the floor. "It woke me up with a tremendous roar. I thought I was going crackers." At the offices of the town's local newspaper, The Market Rasen Mail, the earthquake broke the usual daily news agenda. Michael Steed, one of the paper's two reporters, said the earthquake had happened too late to make this week's edition, but it was likely to be the front page story next week. He said: "This is a huge story for the town and I doubt very much there will be anything quite as big for a while." At local New Age shop, The Rainbow Room, shopkeeper Keith Welstand said the earthquake had been the main topic of conversation among his customers. "It's a quiet little town and some people say you only go through Market Rasen to get somewhere else, so it's quite amusing to have all this attention." But the town's residents seemed to be coping well with the sudden publicity. Major David Garrad from the Salvation Army, said: "The town is usually quiet, especially on a Wednesday, because it's half-day closing. "I've had several reporters down here speaking to me. "I think a lot of people are lapping up the attention." Did you feel the UK quake?